‘I may not be the strongest….or the fastest…but I am sure as hell trying my hardest’! Happy Feet! The OP Jaisha debacle at the Rio Olympics is a grim reminder of how important hydration and nutrition are for the endurance athlete. Not glamorous enough….quite a few of us overlook these issues….at our peril….to tank the second half of the 21.1k…and then lament – ‘I ran the first 15K beautifully and then my legs just gave up’ ! 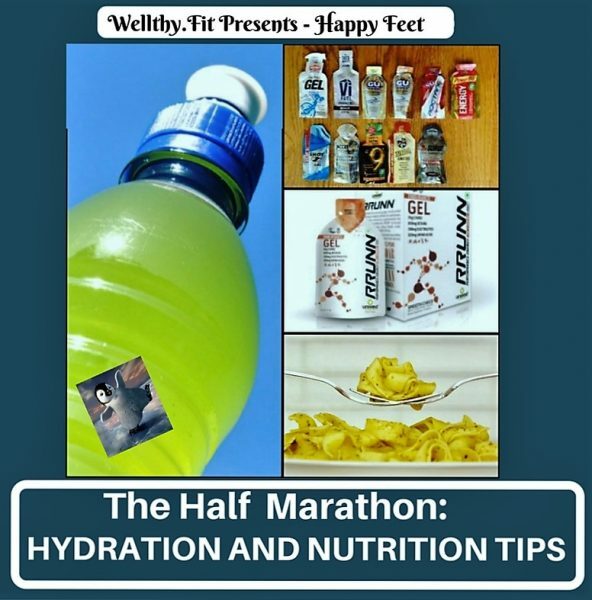 Time to understand and implement the hydration and nutrition aspects of the half marathon. To start the race with optimum hydration and maximum energy. To slake thirst, avoid dehydration,cramps and be able to finish strong with a smile. To recover soonest and be ready earliest for the next big one. Like most things about long distance running the science of hydration and nutrition too has many viewpoints. So instead of technobabble and the endless analysis of pros and cons of each, we have curated our combined experience of 30+ half marathons in Delhi conditions since 2014. The exact requirement of what works when and in what quantity is unique to each runner. Hence, trial and error are the buzzwords. The Need. To maximise your running fuel (glycogen) prior to the race. The Methodology. Increase the percentage of carbs in your diet to about 60-70% three to four days prior to race day. Easily digestible carbs such as pastas, rice, chapatis, potatoes, etc help. Don’t go overboard or you may end up gaining weight ! Avoid oily foods to prevent the heavy bloated feeling. Increase your water intake concurrently to keep up your hydration. A sports drink, such as Gatorade, or a glass of homemade lemonade a day will up your electrolyte levels too. The Need. To top up your glycogen and hydration before the race. Nutrition Methodology. Have a light breakfast two to three hours prior to the start time. Choose wisely as we do not want to have gastrointestinal stress. A couple of bananas and a small bowl of oatmeal or a peanut butter sandwich is ideal. Experiment to find out the right combination of type, timing and quantity. Remember – eat you must but eating heavy will make you sluggish or go Porta-potty hunting ! Hydration Methodology. Upto 500 ml of hydration with water or a Gatorade prior to the start is good enough if you have hydrated well in the preceding days. The Need. To quench thirst, avoid cramps and dehydration. Finish strong. Hydration Methodology. Start hydrating early. Do not wait for thirst to become too strong. Practice small sips on the run. Ideally, hydrate every 3 to 4 km alternating between water and a sports drink. Underhydrate and you will suffer from cramps. Overdo it and you will have water sloshing around your belly, urge to pee and electrolyte imbalance in extreme cases. You should have tried out the sports drink being provided by the organiser beforehand. Unived RRUNN During Sports Mix or Gatorade or Enerzal (all easily available) are good alternatives in case you are carrying your own hydration. Nutrition Methodology. As a ballpark figure. our body can provide glycogen for 90 min of sustained running. It needs to be refuelled to maintain the pace. Ideally the average runner must consume some nutrition every 45 to 60 min to avoid suffering the glycogen blues. Popular options are bananas, dates, raisins, chocolate (works for me) and running gels. Avoid having these with the sports drink as the combined sugar hit may become too strong. The Need. To recover strong and soonest. The Methodology. Our body benefits the most when the correct nutrition is had within 30 to 45 mins of finishing the race. It needs a combination of carbs and proteins (with carbs being approx 60%) to replenish its glycogen reserves and repair muscle damage. So don’t skip the post race snack ! Several post race recovery drinks and smoothies are available. Our recommended option – Unived RRUNN Post Sports Mix. Chocolate milk is another option. The hydration and nutrition requirements of each runner are different. The need is to try out various options beforehand to come up with the strategy which works best for you. Remember the Golden Rule – Nothing new on race day! A little something for the first time half marathoners who rely on Energy gels for their pre and during run requirements: Firstly it’s critical you practice ingesting gels in your training as your fueling strategy and not straight away jump to having them for the first time on the race day. Every runner absorbs and processes energy gels at a different rate — some can feel the kick in five minutes, while some might feel the energy blast in 15 minutes. Ideally you shoul dbe taking your first gel 15 minutes before the race and we recommend waiting about 45-60 minutes between gels before taking another one. In a half marathon, if you are depending upon a gel alone for your nutrition requirements – you could have upto 3 energy gels at the maximum! 2 is fine too! Always remember to drink water after taking an energy gel. Do not have it alone or with a sugary sports drink. It takes longer to digest an energy gel if you take it without water. Various energy gels are available in the Indian market. Disclaimer. The views and recommendations expressed are those of the author from experience. No samples of products recommended were provided. Have a query? It’s your first half marathon, don’t hold back any questions! Ask us and stay Happy Feet! Race Day – All that you need to know! Enlightening ! What is name of energy gels available? HI Pooja, You get the PowerGels in India and also you may want to find a dealer for GU Gels, or could order them online! Excellent article for amature rrunners. Very informative T.. thanks for digging deep n and putting it together for us. Which chocolate can we have during the race?